Ivona Voices 2 All Languages: American English, American Spanish, Australian English, Brazilian Portuguese, British English, Canadian French, Danish, Dutch, European Portuguese, French, German, Icelandic, Indian English, Italian, Polish, Romanian, Russian, Spanish, Swedish, Turkish.Natural speech sound and top-notch quality voices for your PC or laptop. Enrich your Windows and apps with the voices of IVONA lectors of studio-like quality! Natural speech sound and top-notch quality voices to install and use on a PC or laptop. 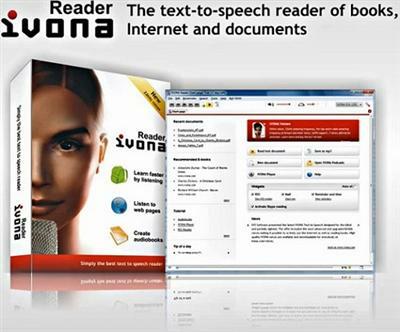 In addition, free IVONA MiniReader - a useful and simple text reader for reading and listening to texts, e-books and documents using IVONA 2 voices. Our team blends passion, technology, and user experience to create innovative text-to-speech solutions. We are looking for results-oriented individuals to join us in achieving our vision to become a global leader in text-to-speech technologies. - Packages at special price! - American English, American Spanish, Australian English, Brazilian Portuguese, British English, Canadian French, Danish, Dutch, European Portuguese, French, German, Icelandic, Indian English, Italian, Polish, Romanian, Russian, Spanish, Swedish, Turkish.